We made this recipe during our extended stay at Steel Bridge campground outside of Weaverville, CA. 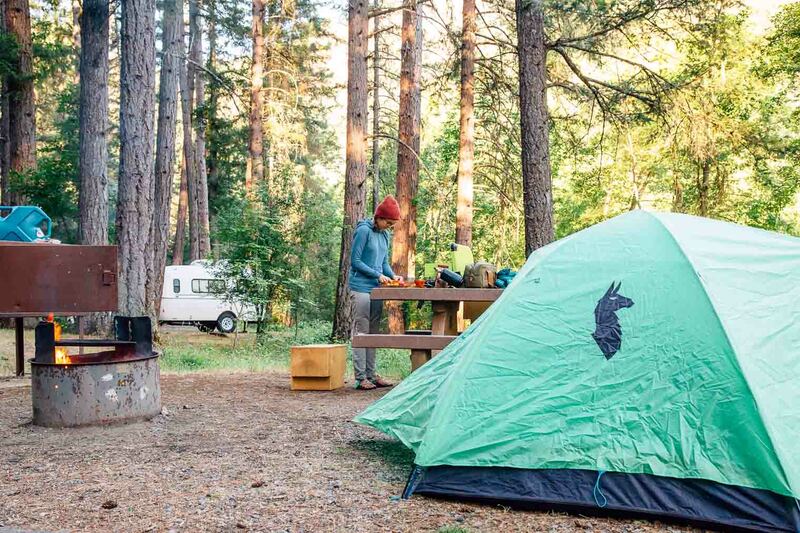 While it might not look like much, it definitely would make our top 10 favorite campgrounds we’ve stayed at (possibly top 5). So why is it so great? 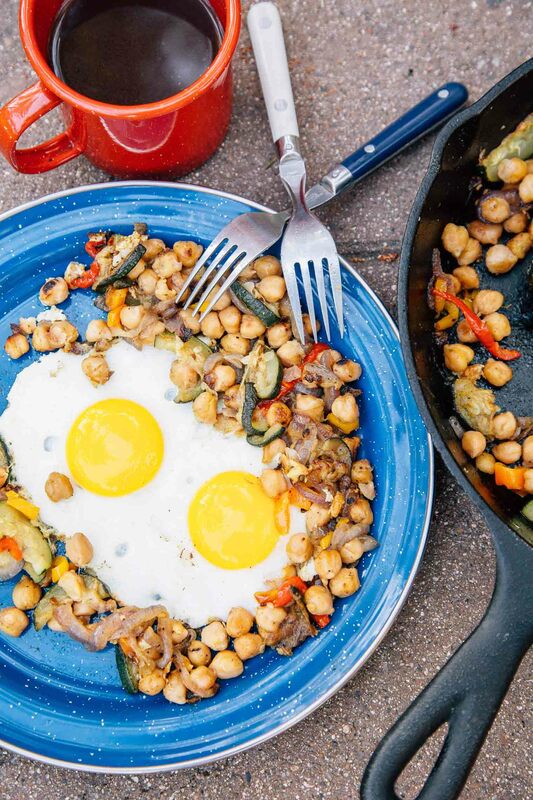 Anyways, we came pretty close to maxing out our 14 day stay limit here, which allowed us plenty of time to develop recipes ideas like this chickpea breakfast skillet. We love traditional potato hash just as much as anybody else, but while the toasted potato goodness is absolutely delicious, it doesn’t quite have the staying power we wish it had. Usually by sometime around 11am, we’re hungry again and looking for an early lunch. 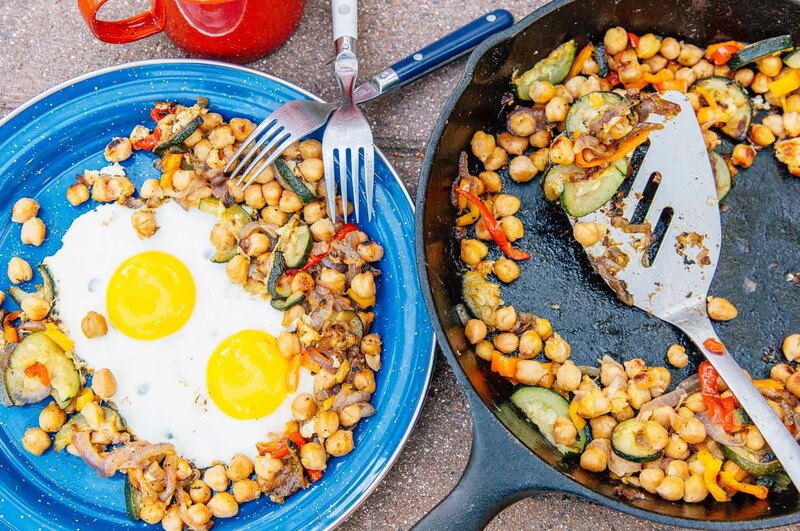 So in order to give this breakfast skillet a little more oomph, we decided to toast up some chickpeas instead. When properly drained and rinses, these beans brown up nicely – while also providing some extra protein to the dish. 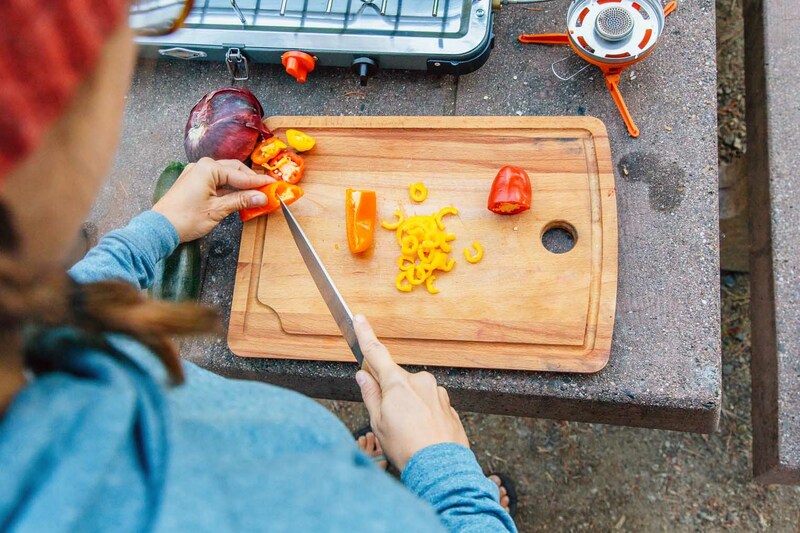 We also included some seasonal vegetables into the mix to give the skillet a lighter, summery flavor profile. We finished the dish with our standard sunny-side up eggs. The trick here is to make a well in the hash, add a little extra olive oil, drop in the eggs and then cover. The pan cooks the eggs from the bottom and the trapped steam cooks the eggs from the top. This technique allows you to get firm whites and perfectly runny yolks. 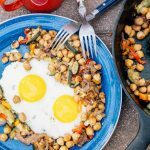 So if you’re looking for a little variety for your morning breakfast skillet or want to add a little more protein to your hash, give this chickpea version a try. 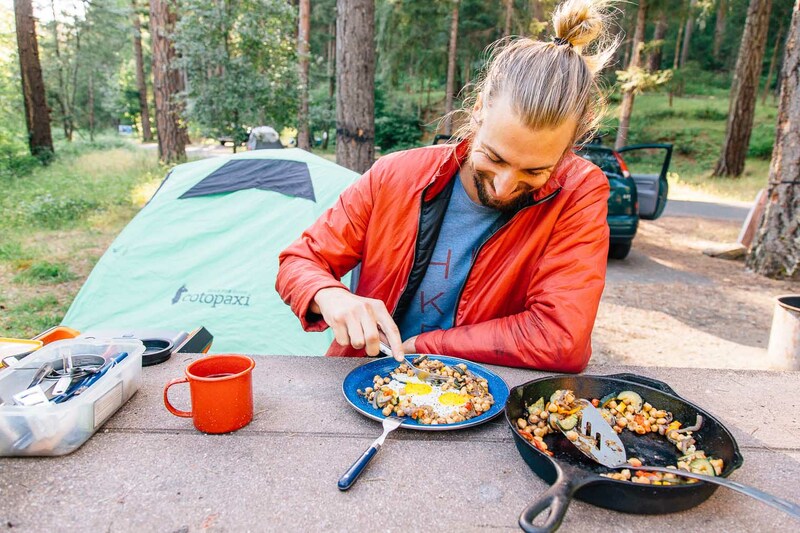 A protein packed gluten free and vegetarian breakfast hash perfect to start your day while camping or at home! 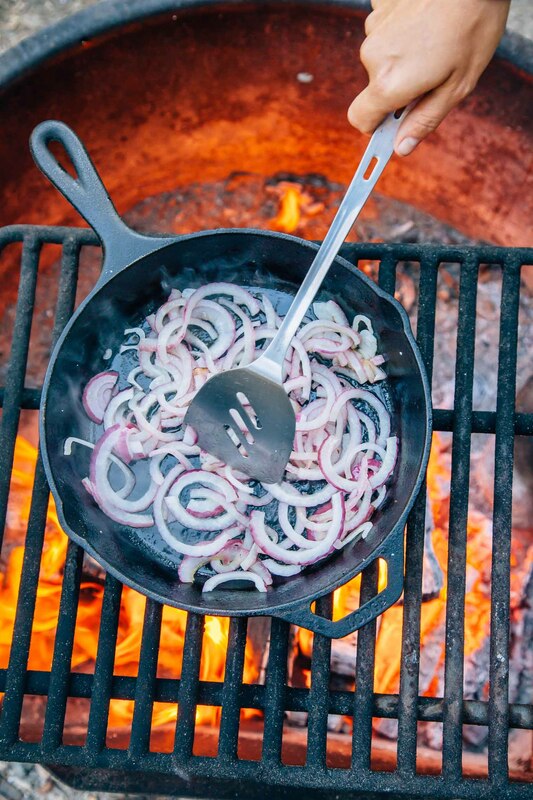 Heat the oil in a skillet over your campfire or camp stove on medium-high heat until hot and shimmering. Add the onions, peppers, and zucchini and saute until beginning to soften, about 5 minutes. Add the drained chickpeas and spices and cook until the veggies and chickpeas are cooked through and browned in spots, about 10 minutes. 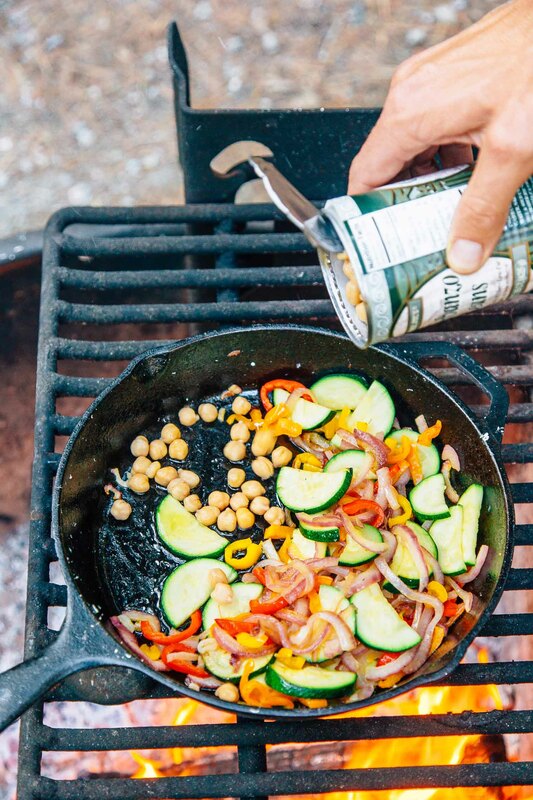 Move the veggies & chickpeas to the sides of the skillet to create a well in the middle of the pan. Add a little oil if the bottom of the pan is looking dry. Crack two eggs into the well and cook to your liking. 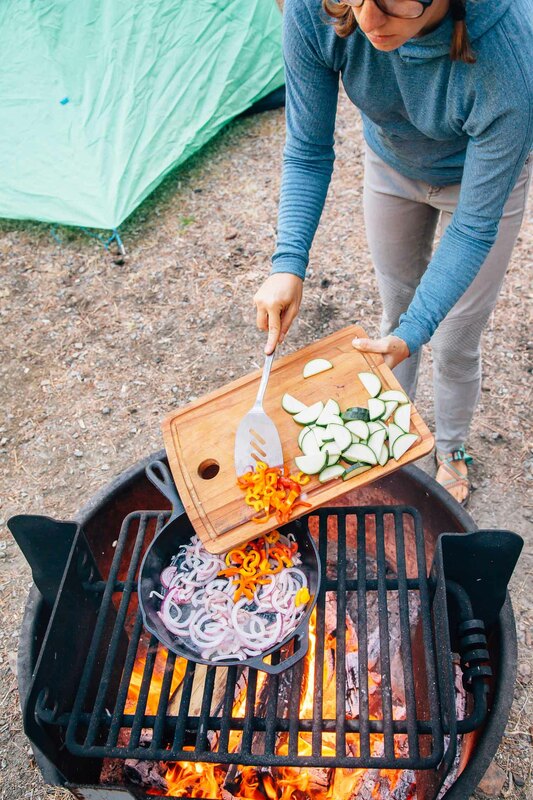 Thanks, I used a couple of your recipes on a recent camping, off the grid, trip. Both worked really well. This one is similar to a breakfast I make at home but replace the chick peas with cooked mung beans, and then add whatever veggies I have at hand at hand. So glad you enjoyed this one Dave! We’ll have to try it out with the mung beans sometime! This looks delicious and a nice way to get my fibre in. Love this! We may actually try it with tofu sometime too. Ooo!!! 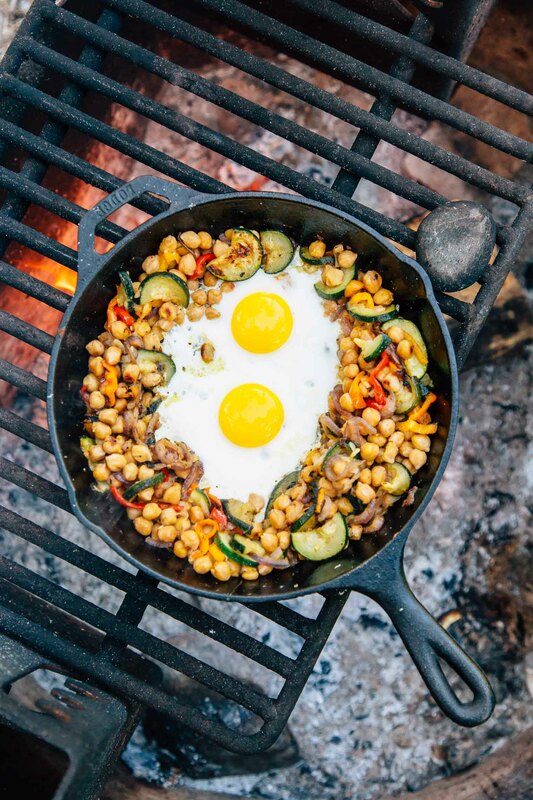 If you pre-chop and season the veggies this would make an awesome backpacking breakfast! The standard oats always leave me way hungry by mid morning! Agreed about the oats! I have to really doctor them up with seeds and fruit to keep me happy until lunchtime. Veggies seem to carry me through much longer!